Don’t be left behind by your competitors! Tap into the Gift Card Explosion. With Electronic Gift Cards, you get a complete package of marketing features designed to maximize your sales, plus the administrative and security features you need to make program management simple and cost-effective. Transactions are processed through your Payment Terminal and receive the same high level of security provided by Elavon’s powerful network. Additionally, gift cards are processed with the same speed and ease as credit and debit cards, which means there’s no hassle of manually processing paper gift certificates. Don’t give your competitor’s the Gift Card advantage! Electronic gift cards encourage repeat business, attract new customers and boost sales all year long. Gift cards are purchased as a gift, given to someone the customer knows. That will result in another customer visiting your store. Many recipients of gift cards will spend more than the dollar value on the card; this represents an additional sale. For those customer that do not spend the full value on the card, you will likely benefit from a return visit by the customer. Gift cards solve the problem “what to buy for….”, they are an easy way to help your customers find a gift for the hard to buy person on their list. For the practical customer, gift cards allow their friends to buy what they want; size and color do not become an issue. Gift cards are an ideal way of promoting your business without spending a large amount of money on media based campaigns. 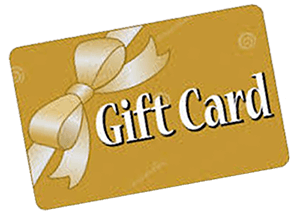 Gift cards can be given as prizes, corporate/charitable donations, come-back rewards, customer appreciation, holiday and special occasions, etc. Rather than refunding by cash or credit cards, you can add the refund the amount to the gift card; no financial impact, customer will come back and most importantly refund value cannot be used at a competitor. a. You receive a daily report on all gift cards processed. b. Your customers can inquire on their card balance Inquiry via their telephone. a. Gift cards have no value until they are activated. b. Lost or stolen cards do not create a financial loss or liability. A very cost effective solution that is easy to start and manage. Choose from an attractive selection of 10 pre-designed card styles. Add a single color logo or customized text in your choice of font style and color. Order 100 to 1,000 cards and your customers will be loyal in no time.